A first person narrative of how a small city in the North Georgia hills took responsible care of its railroad collection without emptying the treasury in the process. Gainesville, Georgia is a pleasant community, suffering from having three roads with bridges crossing Lake Lanier pass through its center, and being on the edge of Atlanta&apos;s insatiable suburban sprawl. It has long been a center of poultry production, and now supports a large immigrant population of chicken pluckers and processors. 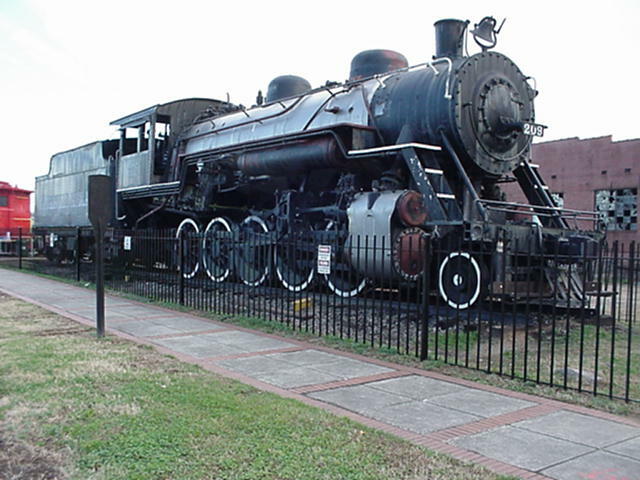 In the late 1950s, it was the last bastion of steam in the Seaboard Air Line group of affiliates, thanks to the Gainesville Midland railroad, which ran decapods and a pair of 2-8-0&apos;s through 1959, before finally dieselizing in 1960. The engine in Gainesville, 2-10-0 No. 209, escaped a similar fate. It was vandalized in the usual ways, and then largely ignored by most of the citizens for many years. 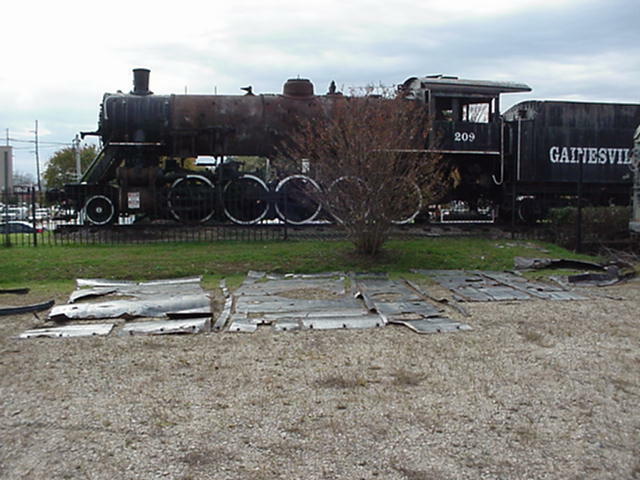 In 1991, it was moved from its original display location along with a steel Seaboard Air Line caboose and a Southern baggage car, and put on display at a traffic-jammed intersection, on land which had been part of the GM yard. A group of local citizens built a small railroad museum in the baggage car, did a paint job on everything, and manned it on weekends for a while. But after these benefactors burned out, nothing much happened for more years. The neighborhood would eventually undergo redevelopment, but before that happened the caboose became overflow accommodation for a local brothel, and at least one person set up housekeeping in the tender tank. A "before" view of the front right side. We didn't take any full length shots at this point - these are documentation for how the removable stuff gets re-attached weeks down the line. Redevelopment happened, and some of it was actually good. The Gainesville Midland passenger terminal building was saved, but the railroad infrastructure surrounding it removed. Many of the older structures nearby are now being demolished for construction of mostly banks, and a considerable number of other older buildings have been demolished at the nearby square for ugly modern concrete municipal structures and parking decks. The city is now about to redevelop an industrial corridor along the part of the GM which came into the city center, and is making the mistake of removing the track, which could be a valuable future commuter rail link to Atlanta, and serve as a development catalyst if left as an integral part of the plan. So here we have the sense of the place and time - a community, which was an agricultural center, under severe development pressure and undergoing rapid growth, and without the sophistication to control it rather than react to it. When the real estate people and activists began to complain about the eyesore railroad collection, and the asbestos leaking through the rotted jacket, the city was under some pressure to do something about it. 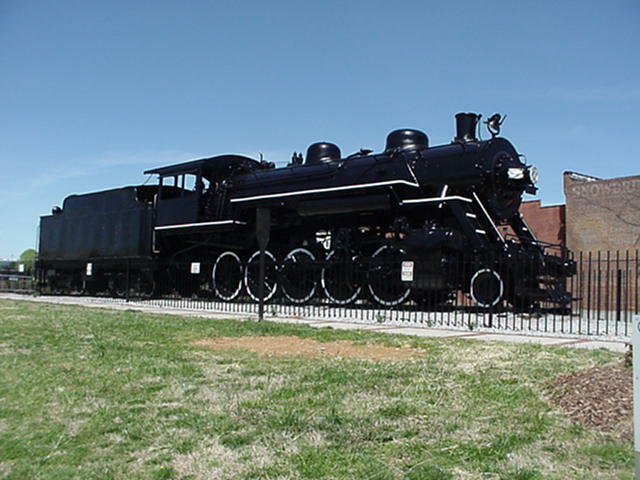 Enter a proposal from a railroad museum in Tennessee, which inspected the locomotive, and made a formal proposal at a city council meeting to acquire it. There was an immediate backlash, and the northern brethren were fortunate to escape without injury. Having been awakened, the city determined that "something had to be done" and directed Jim Hamblen, Superintendent of Public Lands and Buildings, to deal with it - and as cost effectively as possible. Jim is a buildings guru, and has never had to deal with railroad rolling stock before, but he is the perfect kind of public sector manager to deal with an unfamiliar contracting problem. He has been a construction contractor, been around a lot of different kinds of projects, and knows what good management is. He isn&apos;t easily phased or upset, and is practical and comfortable with a learning curve. I met Jim at the site in August where we looked over the situation generally. The locomotive, tender and caboose sit on a landlocked section of track facing the corner of the block. The entire side of the block is occupied by the city owned property holding the railroad collection. 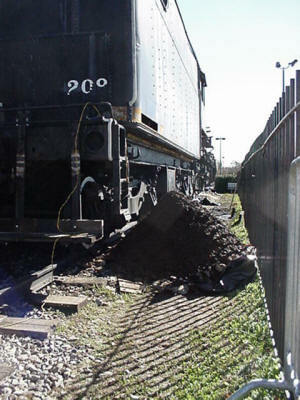 A concrete walkway separates the tender and the caboose, and leads into the side door of the baggage car, which occupies another shorter section of track. All pieces are enclosed by an iron fence, which also separates the city owned property from the privately owned empty lot behind. Power is from a pole to the rear of the caboose, and the baggage car lights and a few outlets are hard-wired in underground. The empty lot is accessible only from the street to the rear of the caboose, and is a good place to bring in a crane, load parts, tools and supplies in and out, and park work trucks. A water standpipe for a hose connection is near the power pole. Logistically, the project didn&apos;t seem too difficult despite the outdoor venue. We could install a 220 outlet on the pole for the welder, and run a looooooong drop cord. The baggage car could be secured and used for tool storage. Things were looking more possible. The hazardous remediation of the asbestos was a priority, and an asbestos contractor proposed he bring in a crew, remove all the piping and other impediments with a torch and scrap it out, and then remove the asbestos and jacket. A local painter could then paint the boiler shell, as well as the tender, baggage car and caboose. While relatively inexpensive, this proposal was not universally admired within the city government. Several people remembered the locomotive as it had been, and one fire chief in particular opined that it would be better scrapped than treated that badly. 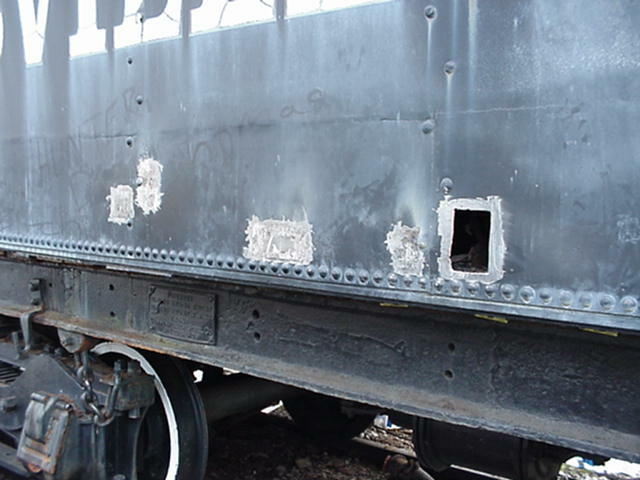 Jim determined that, if it could be afforded, the locomotive should be stripped with a wrench, then the asbestos remediated, then rejacketed and reassembled before repainting. A budget of $75,000.00 was set aside for cosmetic restoration of all three pieces. Jim now had to figure out how to do all that with those limited funds, and, by the way, preferably within 120 days. It was now September, and fall and winter in the hills can present unpredictable periods of nasty weather. All work had to be done outside where things sat. I was just finishing up an intensive replication of a Marietta streetcar from the hulk of a Cincinnati Curveside streetcar body, and looking forward to a short vacation in Pennsylvania and New England. I couldn't make myself available to start the job until late October. I didn&apos;t know just what could be done with the $39,900 set aside for the locomotive work, but was pretty sure we could at least do the disassembly, install a new jacket made by the local sheet metal shop, the reassembly, replace the wood deck on the tender, and patch the rot holes in the side of the tender tank. Beyond that, some conservation work and detail repairs could possibly be done. I could work on making bits and pieces look good until he got tired of writing checks. Jim offered the use of the city maintenance shop and whatever resources he could provide without interrupting his ongoing work too much, and had some flexibility in the deadline. He could provide local references for suppliers. He had separately contracted with an asbestos remediation contractor and painter, both of whom were beyond my control, yet the deadlines I had to meet were dependent on their getting their work done in a timely way. We agreed in principle on a "not to exceed" contract, and I went on vacation with the idea of starting work upon my return. Knowing I would need some strong young and qualified assistance, I called Jason Sobczynski in Michigan, who had just finished working a temporary series of projects for the Henry Ford Museum in Dearborn. Jason is from the Atlanta area, and knows where every scrap yard and source in North Georgia is located. I had previously hired him for the shop in Savannah when I was moving on, and they needed a good steam mechanic and skilled shop guy who was younger than the locomotives. Jason was pleased to head home and take part in the project, 209 had been of particular interest to him for a while. In late October, I returned to Gainesville to sign the contract, get keys, and arrange to begin bringing in tools to get to work. One requirement was general liability coverage, with the city as additional insured. I called the railroad specialty insurance agent I had used in a similar situation before, whose representative assured me I could expect coverage within a couple days at favorable rates. I went to load the truck and get started. October 27, 2004: I arrived with a truckload of tools to find the street, which offered access to the empty lot, torn up and blocked. Turns out the city street department doesn&apos;t take the plans of the city buildings and land department into consideration when starting repaving jobs. We were advised it would be a quick job lasting no more than a couple weeks. Jumping the curb, I unloaded on the grass, and hauled everything the long way into the baggage car. The baggage car, of course, needed to have the lighting repaired, the doors made operable, and be generally cleaned out. Jason arrived at 2pm and we got very busy. We soaked everything on 209 down that we thought we needed to remove with PB Blaster. Jason had another surprise, but a pleasant one. He called two old acquaintances of his who are affiliated with the Hartwell Railroad, and are available on weekdays. Enoch Craven and Warren Douglas volunteered for the duration of the project. Enoch in particular was devoted to the project, since he grew up in Gainesville, and, when he was a child, visited his father in his office within view of the GM enginehouse. 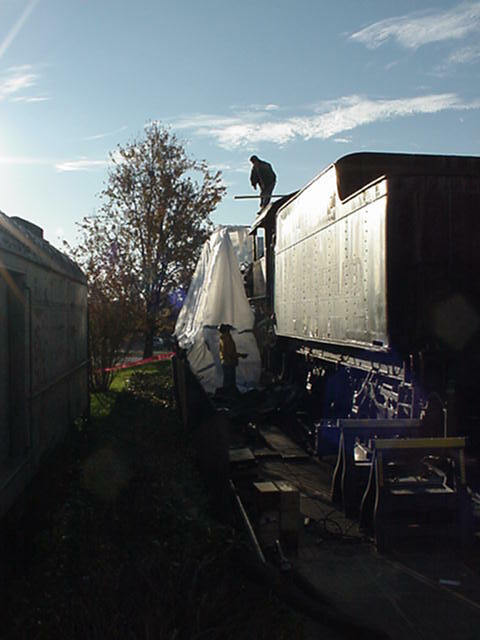 Disassembly ensued, and by October 28, general repairs were complete to the baggage car, the cab was stripped, and an outhouse had arrived. We began removing piping, appliances, and whatever else looked like it was in the way of abatement. I still had not received an insurance policy. Repeated inquiries did not result in a resolution. On November 1, I stopped in at a local insurance agency, and bought a policy that satisfied the city&apos;s requirements in 20 minutes. Work continued to progress in loosening and removal of miscellaneous hardware, for the next few days, including documenting what went where. Arnie Johnson, from the Southeastern Railway Museum, stopped in to help one day and handled the grubby job of unplumbing the lubricator and associated lines. Many things unbolted with little trouble, but just as many needed some thermal persuasion before loosening. A few bolts couldn&apos;t be loosened, and were burned off. Until I discovered that they weren&apos;t my riggers. They were a crew out of Atlanta, hired by Gladys, the owner of the adjacent property, to bid on moving the locomotive and baggage car to another location in town, and take the caboose to an antique mall in the NC mountains. None of this was known by the city. Gladys no doubt wanted the rest of the block for development, no matter that she didn&apos;t own it. A case could potentially be made that a location on track might be a better venue for the display, and the benefits of returning the city property to the tax roles might be worthwhile, but it did come as a bit of a surprise. We debated the relative ease of moving the stuff on its own wheels rather than by heavy haul lowboy (you need to see the location to understand) with the riggers, and then gave Gladys an estimate when she showed up later on. I&apos;m not holding my breath. So far, the weather had been unseasonably fine, and we were anxious to get the heavy lifting done before the arrival of rains predicted for later in the week. We tried to reschedule the boom truck for November 10th, but no luck there either, although we did make good use of the day for more tender work. The whole crew spent the cold windy morning of November 11th rigging in the driving rain, and we managed to get all the heavy lifting finished, and the boom truck back to the barn, within the three-hour minimum charge. Soaked and shivering, I bought everybody lunch at IHOP across the Poultry Park from the engine. Asbestos abatement contractors building the enclosure. The asbestos contractors started work the following Monday, and were done and gone by Thursday. We took advantage of their occupying the locomotive to start cutting out rotted areas of the tender tank. Spot repairing tank rot with flush patches. During the following week, we brought in the local sheet metal shop to look at the sections of old jacket we had patched and laid out in the empty lot. Wallace Sheet Metal offered to donate half the cost of the job, and to assist us with the use of their shop for other small specialty jobs. Rather than use 14-gauge sheet iron, we specified 20-gauge paintable galvanized steel. They planned to have the jacket finished within two weeks. Old jacket laid out for measurement - 209 naked in background. The two week paving project showed no sign of coming close to reaching its conclusion, even though we were now in the fourth week of the job, and the paving guys were making much more use of the outhouse provided for our job then we were. The week of November 22 was rainy and nasty, so we took a few days off. It was OK because the volunteer and other community support was moving the work on more rapidly and at lower expense than originally envisioned, so we could do some extra work, and to conserve and document what was there. Although it wasn&apos;t in the contract, we did clean out the firebox and blow the flues, and empty the ashpan. Not only will this help preserve the remaining metal, but we found the broken-off outer half of the throttle lever and much of the wooden cab doors in the firebox. 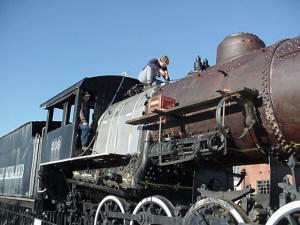 We also cleaned out the smokebox, and squirted Great Stuff into areas we wanted to prevent water from entering again. 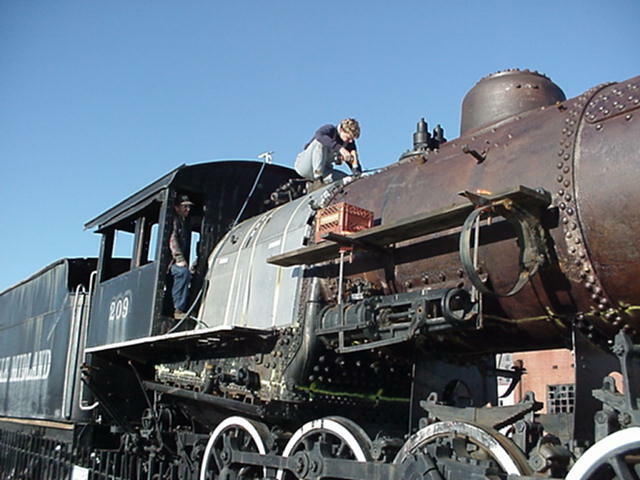 We took the time to do some ultrasound measurements in the usual trouble spots on the boiler, since the locomotive itself didn&apos;t show any "red flag" conditions which might preclude its operating restoration at some future date, if desired. 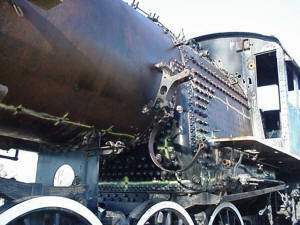 The boiler tests did not reveal any bad areas, apart from some sections of the firebox as is commonly found. A sketch showing the tested areas and results was done for the city to keep in their files. While the locomotive is in decent shape, the tender is total junk. The center sills are badly cracked by the front bolster, and the cast frame badly eroded in many places. Both trucks are in terrible condition, with the bolts holding the truck frames together either worn or bent into crankshaft configurations. I have alluded to tank rot - it is apparent that isn&apos;t a recent thing. The railroad had done some extensive patching, both flush and scabbed. The tank baffles were gone at the lower ends. The floor was ankle deep in rust scales and trash. Mount Rustmore - about half the scales removed from the tender tank. The rotted-through areas provided some access for shoveling out the accumulated stuff. It wasn&apos;t a lot of fun - hunched over with a broom and shovel, hauling 50 pound buckets of grunge around baffle remnants to where you could shovel it out through the side sheets. While I was working in the tank alone on Saturday, an undocumented alien stole the license plate off my pickup, which led to an interesting conversation with the police later that night. Still, it will help preserve what remains of the tank. We repaired the removed sections using the same technique the railroad had used in adjacent areas, either flush or scabbed. We treated the inside of the tank (where it seemed reasonable) with Ospho rust converter. After making all inner repairs, we installed a padlock on the tank hatch to prevent further trashing. Coal bunker roof almost finished. The coalbunker presented another challenge. These locomotives had been retrofitted with Berkeley stokers, and the troughs were natural grunge and rust pits. 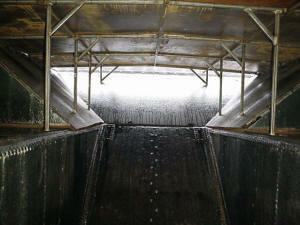 The slope and side sheets of the tank were badly worn and patched. The solution was to build a low, sloped roof over the bunker, which isn&apos;t visible from the ground. To save money, we used recycled steel from a local scrapyard. This, combined with welding closed the coal doors and making a top for the front of the tender, created a secure storage space where we could entomb such items as little copper lines and fittings, and the in-cab jacket, which we were not reinstalling. The rear buffer beam was rotted in part, but the bolts were good, and it wasn&apos;t drooping much, so it was filled with vinyl concrete patching compound. I got the idea from a dental appointment a few days previously. Going into week 6, the 2-week paving job was still going strong, with the contractors doing such things as digging holes in the morning and filling them in again in the evening, only to dig them up again the next day. 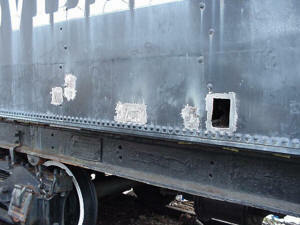 The painting contractors began work on the baggage car December 8th. The new jacket was to be laid over a spacer of Styrofoam, to replace the asbestos. A personal visit and short storytelling session with a local foam company got the foam donated entirely. Boiler shell treated with Ospho rust converter prior to application of new jacket. The weather was nicer, cool but sunny. We treated the entire boiler shell with Ospho, and went to pick up the jacket on December 13. The jacket was not done; there were some questions to be answered. Answers and motivational commentary ensued. We took advantage of the delay to do some little customization jobs, like fabricate and install some little circular steps to the front of both sides of the tender tank. They had been removed at some point, but the evidence of their location was visible, and the sister engine in Winder still had them to copy. Winder also loaned us their firedoor handle to replicate as well. Over the next couple days, we took the piping to the city shop for the painters to clean and prime, and repaired the appliances, domes, running boards, etc., there so the painters could get a head start. On the 16th we picked up the bulk of the new jacket, and started gluing foam strips on the boiler with construction adhesive. Jason (on top) and Enoch (in cab) install first sections of new jacket over Styrofoam spacers. December 20 through 22 was spent installing all the big parts of the jacket over the foam. After being manhandled into place, we used nylon strap clamps ($1.99 on sale at Harbor Freight) to cinch them semi-tight. The top seam was pop riveted together, and then the old jacket clamps, which had been cleaned, bolted to the bottom. Using threaded rod and nuts, we tightly cinched the new jacket sections over the foam. Once tight, the bottom seams were also pop riveted together. We broke for the holidays. The last week of December was spent doing finishing details to the jacket, such as washout plughole flanges, and seam band installation. We also installed the cylinder jackets, and repaired or ran new electrical conduit for cab, head, and backup lights. Working lighting was another little extra we decided to provide. The only problem with the jacket, left to solve, was the circumferential ring, which closes the front off just at the smokebox. Broke for another holiday. The street-paving job was almost finished, the crews having largely moved on during the holidays, with only the occasional worker and truck coming back to do details. The street department was kind enough to haul over and unload the heaviest parts from the city shop - the sand dome and air compressor. This saved the cost of rigging at the city shop end. Rigging at the site was donated by B.R. Anderson and the Hartwell Railroad, who graciously allowed their boom truck to be used for 3 days in Gainesville. It arrived on January 3, and departed January 6. Having 3 days to hoist and fit all the big ugly parts and associated piping without paying for a crane saved thousands, and allowed us to do a better job without having to hurry. The second week in January saw most of the smaller parts and cab fittings fabricated, repaired, or cleaned and installed. The painters had taken advantage of one good day to pre-paint the backhead black, before all our stuff got bolted back on in the way. On January 13, we finally got the front jacket ring to fit properly, having altered it three times, and brought Jim Hamblen in to inspect the job, and choose what finishing details we would complete. We agreed to provide and install some new valve handles where some had been stolen, and mount and wire the lighting. Some open pipes would be plugged, and we would make a fake whistle out of PVC and mount it on the dome. Taking off a couple valve handles to match, I went to the local plumbing supply. They had never seen anything like valve handles, and had no idea where I might get some. Wouldn&apos;t I rather just buy new valves and replace the old ones instead? One call to McMaster Carr and matching handles in 3 obsolete sizes were on the way. On January 19 and 20, everything but the gauges and whistle was complete. 209 had lights burning bright all night long the evening of the 20th, for the first time since 1960. Enoch had taken the smashed and rusty pressure gauge faces home to clean and repaint. He returned and installed the repaired gauges, which looked like new. Jason made the whistle, which Enoch volunteered to install, since Jason had commitments to work in the frozen north. I submitted a final invoice January 27. Just a few minor details to bolt on before releasing to the painters. There was enough left in the budget to allow Jim to do some much needed landscaping and other work on the area, none of which had been included in the original estimate. Everybody was happy, we were done ahead of deadline and under budget, and provided more nice finishing details and conservation work than we agreed to do. I passed through Gainsville on March 29th. The reports that the painters had finished painting 209 were true. A local sign company will attend to the lettering in the near future, and the city shop is still working on the wooden parts. No. 209 as seen on March 29th. The painting is complete, but the lettering and fabrication of wooden parts is still in progress. This project worked well thanks to the unusually high community support and interest, and good management at the city level. Jim Hamblen ran interference and provided support, but never once looked over our shoulders and tried to tell us how to do our work. Our volunteer help essentially doubled our work force, at no additional cost. 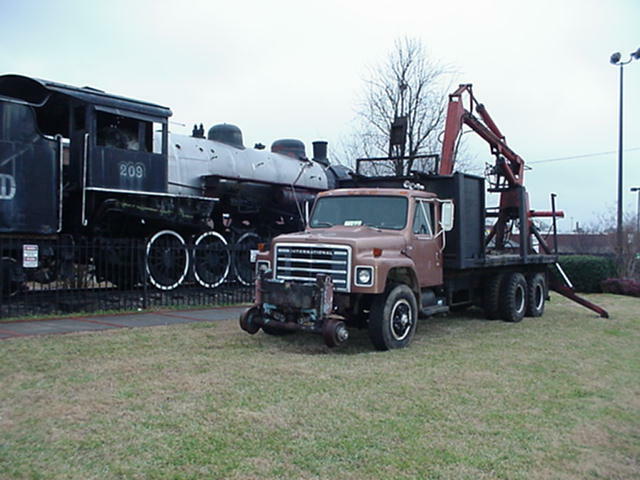 The local businesses that provided in-kind donations of very high quality saved thousands of dollars, as did the Hartwell Railroad through the use of their boom truck. Were it not for this support, only a bare bones patch and paint job could have been afforded after the remediation. 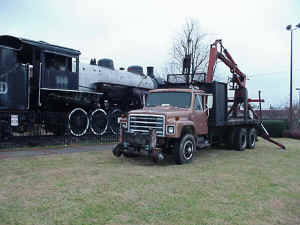 Hartwell Railroad boom truck at work - thanks B.R. Of course, from the other perspective, without involving experienced professional contractors who know the craft of steam and railroading (even if they do resemble Albus Dumbledore and Alfred E. Neuman), the city could not have gotten a good job done at any price. Jim Hamblen is a man with the perspicacity to know when he needs to get specialized help to supplement his crew. He is also aware that the contractor / client relationship needn&apos;t be adversarial. Would, that all public sector people were like him. Apart from the pride in the job, the most gratifying things from my perspective were the visits we got from ordinary citizens who had either been watching as they drove by, or seen the newspaper or TV articles. Nobody expressed anything other than support and interest and pleasure that their tax dollars were going to a worthwhile cause. On several occasions, I took a few minutes to unlock the caboose so a parent or grandparent could take their toddler inside. One older gentleman, who worked on the London and North Eastern before immigrating and working for decades as a truck driver, had tears in his eyes as he told tales of steam. For the first and only time in my career, I was asked by a black visitor if the locomotive had a "real McCoy" lubricator - unfortunately, it had a mechanical instead, but nice to know somebody remembers that bit of history. The wide-ranging support across many segments of the community was very much in evidence. What didn&apos;t work: it&apos;s smarter to be lucky than it&apos;s lucky to be smart, but you can&apos;t count on the fates to be sympathetic. I wouldn&apos;t have been satisfied with the job we could have done, had we not had volunteer and in-kind support, given the available funds. Possibly the city would have, but not as likely. Our ability to provide more than we said we would certainly forestalled any potential dissatisfaction, but given specifications for any restoration job are by nature sketchy, there may have been some disagreements if we could not. Had a less able manager than Jim been in charge, the interaction of several different contractors in a small fenced area could have turned into a Three Stooges scene. 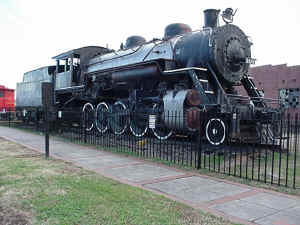 If I had to start fresh with a similar project in another town, I would want to make sure there was about $80,000 available for the locomotive alone, exclusive of abatement. I would encourage the city to seek out community support with the idea of potentially cutting the job cost by a third, and would aim higher in my initial project conception. There are other creative ways costs can be cut - mileage and lodging are not inconsequential, for example - but at my stage of life, while I want to do what I can to work with clients in any way possible, I am not interested in setting myself and them up for a job that is sure not to please anybody just to save a few bucks. I&apos;d rather they either find the locomotive a better home, or, better, raise funds adequate to assure a good job that will please all parties. Compared to the huge expenditures for other civic projects, even at retail cost, locomotive restoration is a relative defensible bargain (provided it has a constituency). I wouldn&apos;t be surprised if Gainesville didn&apos;t spend more on the adjacent street paving than on the entire railroad project - and nobody came by to voice their support for that work, just aggravation at the traffic disruption. For any readers working with communities who are considering restoring their park hulks, but have visions of hundreds of thousands of dollars in costs, I hope this blunt and meandering narrative might help put those fears aside. You can of course spend a couple hundred thousand, and get a museum quality result or an operating engine in return, but it is hard to justify that kind of expenditure on something you intend to leave unsecured, outdoors, in the weather and ignore for the next decade or so. But if your community is like Gainesville in that they do care and want to do a responsible and competent but practical job, with an appearance that will do the community proud, it can be done for a lot less, especially with the support of the community.